Ripening tomatoes is no problem when the sun is shining and the weather is hot. But when cool fall weather arrives, how do you rescue those remaining green ones that weigh down your vines? Generally, tomatoes need temperatures above 60˚F to finish ripening. If frost occurs before you can rescue them they'll be ruined. The green tomatoes that have a tinge of color at the blossom end and feel a little softer than the solid young fruits are mature enough to ripen indoors. The following tips can help. Remove all the remaining flower clusters and the smaller immature tomatoes. This will allow the plant to put its energy toward ripening the remaining fruit a bit more quickly. If you don't have time to remove the fruit from the vine and a light frost is forecast, you can prolong the growing season by covering the plants at night. Use a sheet or tarp which should be removed during the day. When a hard frost is forecast, you must bring your tomatoes inside. There are two popular methods for ripening tomatoes indoors. Dig up and bring the entire plant into a semi-heated garage or basement, where temperatures will remain above freezing. Shake off the dirt, preserving a few roots and pick off the green leaves. 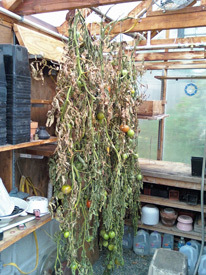 Hang up the vine from a shelf, ceiling or table, out of direct sunlight, and let the green tomatoes ripen naturally. Green tomatoes can also be picked individually and brought into the house for ripening. Place them in a wooden or cardboard fruit box up to two layers deep. Cover the top with newspaper and place the box in a cool spot. Check regularly to remove the ripe ones and any that may have started to rot. If you have several boxes you can sort the tomatoes by maturity and size to make it easier to find the ripened fruit without as much digging. If the picked tomatoes are only a couple of days away from maturity, ripen them in a warmer spot like your kitchen counter, but not on a windowsill where they can get sunscald. Place the green tomatoes in a closed paper sack where the concentration of ethylene gas that the tomatoes give off naturally will quicken ripening. Put them in a closed paper bag with a ripe apple or a slightly green banana. These fruits also give off ethylene gas for an extra boost to speed up ripening. Check the bag daily. No flavor? The storage location may be too cool. Keep the temperature above 55˚F for best flavor. Won't ripen? If your bright green tomatoes aren't ripening, either they are too immature to ever ripen or the location is too cool. The cooler it is the longer they will take to ripen. Try placing them in a warmer location but not in direct sunlight. Shriveling? The storage location may be too low in humidity. If these tips on ripening tomatoes still leave you with too many green tomatoes, find a good fried green tomato recipe or tomato relish recipe!